This is a project I did a while ago for my dogs. They love treats and I wanted to find a nice "techie" way to provide them with treats: a bluetooth treat dispenser! The treat dispenser filled up with treats and ready to go! 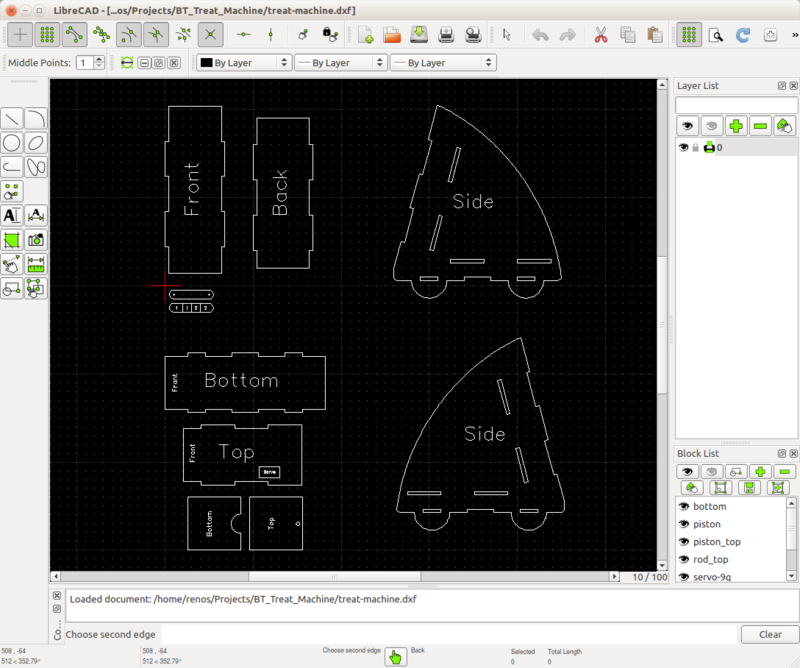 Designing the parts with LibreCAD. 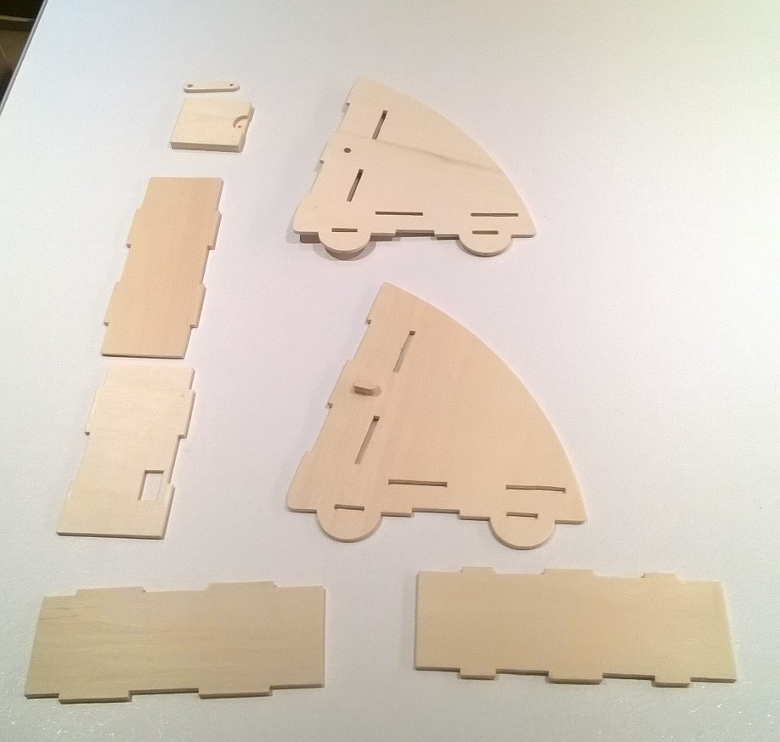 All the parts cut from a 4mm plywood. 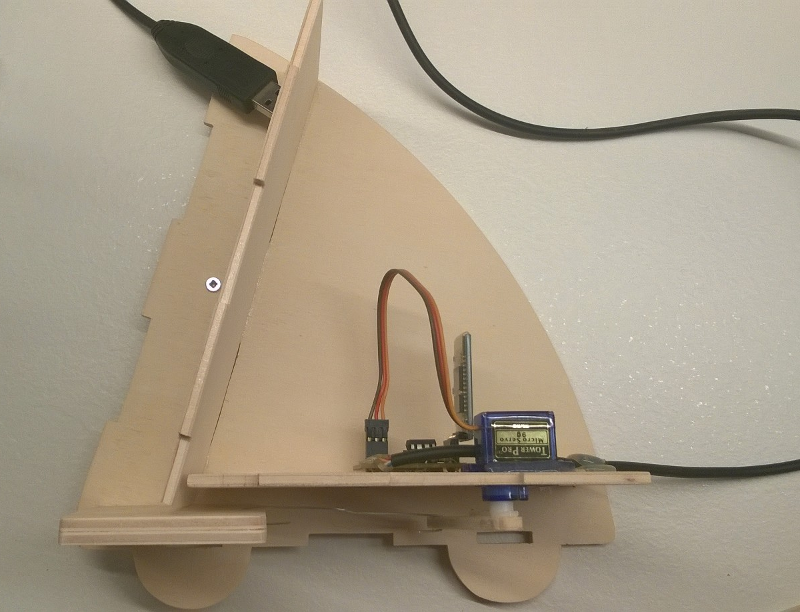 The application for the smart phone was built using AppInventor (http://appinventor.mit.edu/explore/). It only supports Android OS smartphones. I provide both the APK file and the AppInventor project files, if you want to have a go with it or if you just want to install it on your phone right away. 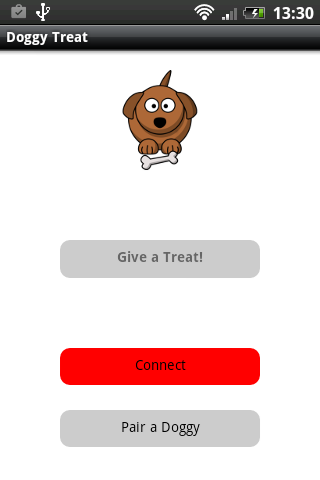 There are only 2 steps involved in the application: you connect to the device (you must have paired the devices before) and you send treats out. Ready to connect to the device. Connected! Send some treat out! I could have used a PicAxe 08m or 08m2, but I had a few older ones 08 lying around and I though I could put them in good use. The Picaxe chip is not doing any complex things actually. It's only using the Serial-In and Servo commands. Actually, I had to emulate the servo command on the 08 using the pulseout (http://www.picaxe.com/BASIC-Commands/Digital-InputOutput/pulsout/) command, since the servo command is not supported on the 08 version. 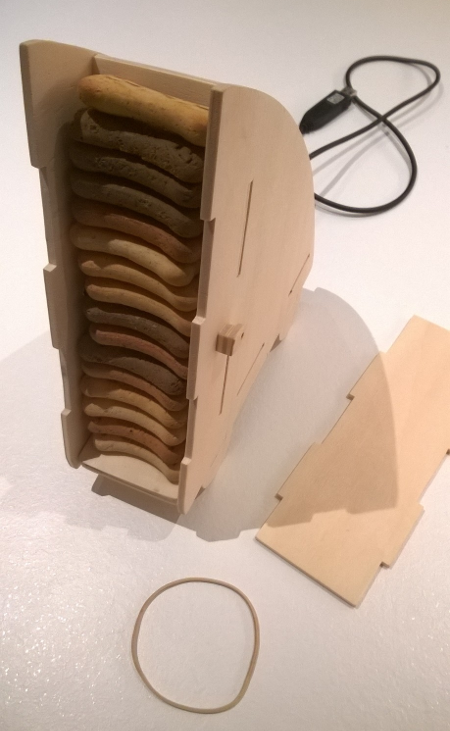 There is a simple 'communication protocol' between the smartphone app and the picaxe chip: just send the '*' character and a treat will be pushed out! 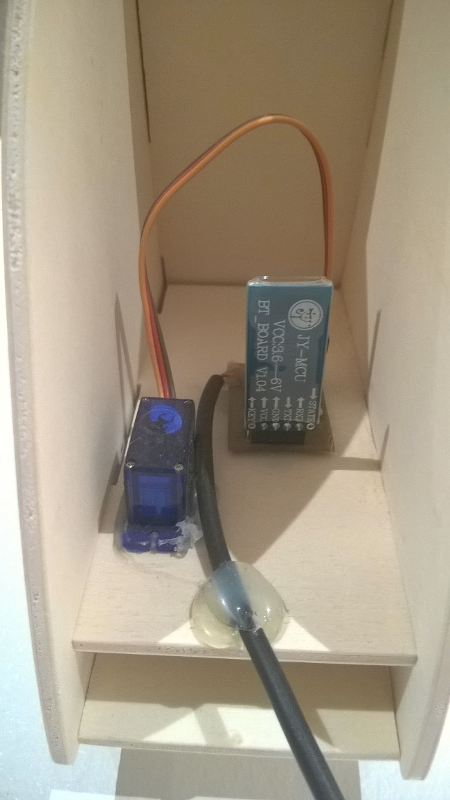 The small PBC for the device. The Schematic for the board. 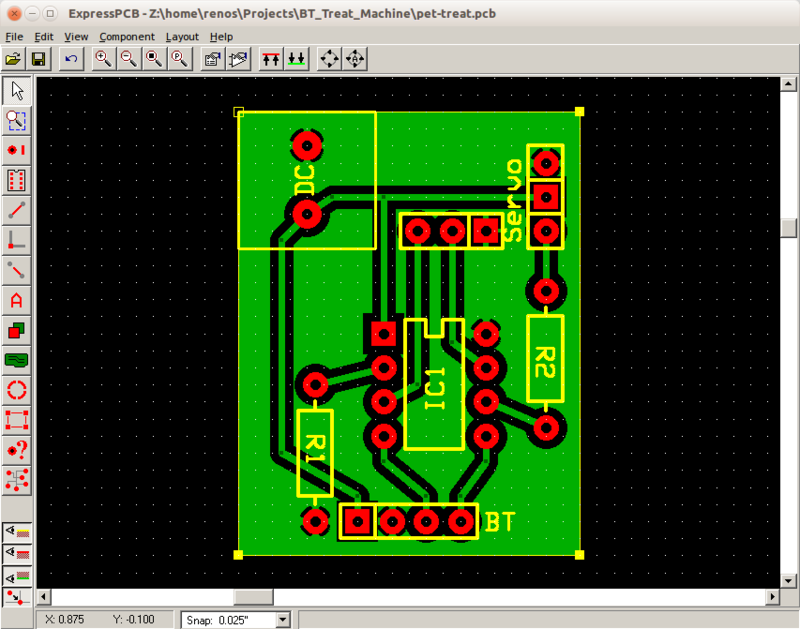 I created a schematic and a PCB board to go along, although the same could be done without a PCB board. 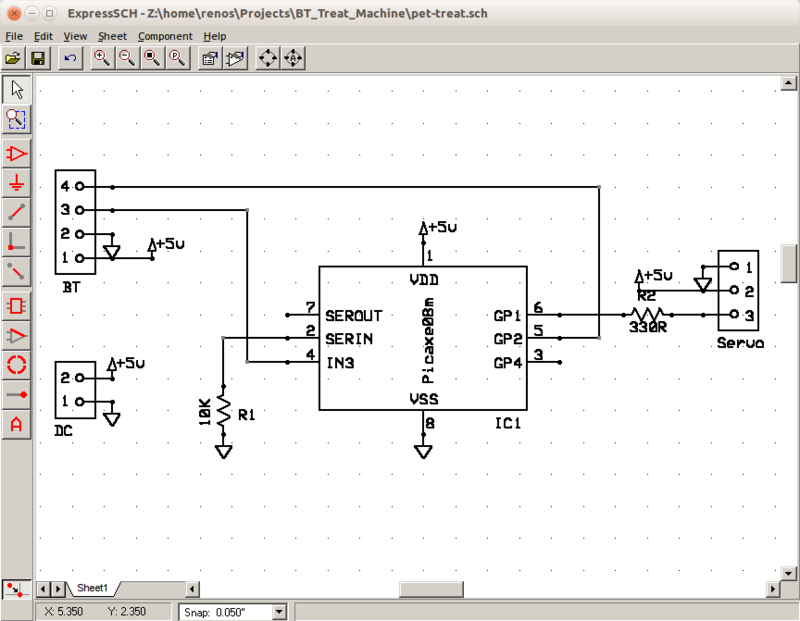 A perfboard would be great as well, since there are a very few components and connections between them. This is how everything look like when they are connected. The working internals of the device. The piston part that pushes the treat out from the dispenser uses a small wire which is fairly easy to bend by hand. The are times that the treat get stuck and I needed a way to protect the servo. 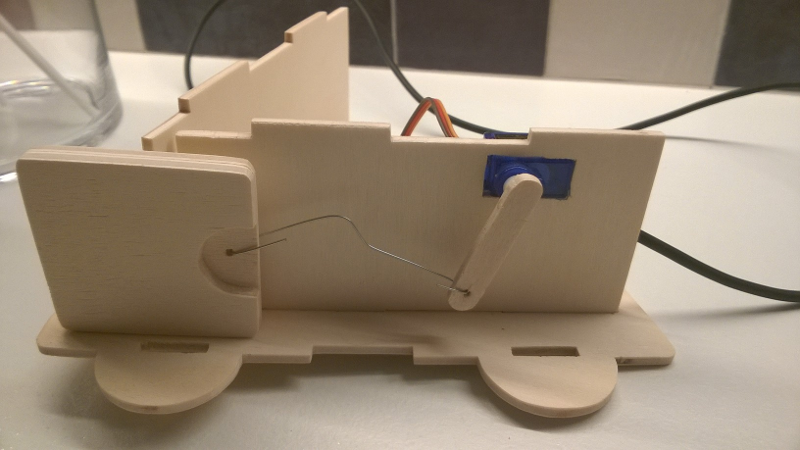 In the case that a treat is stuck on it's way out the wire will eventually bent and absorb all the force protecting the servo gears. You will have to straight out the wire by hand if it bends to much. This is how the 'piston' looks like.